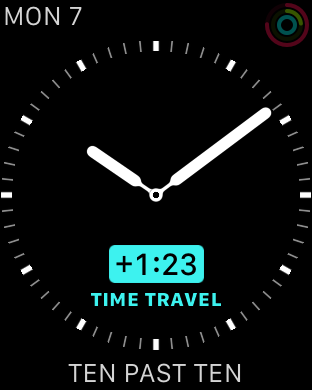 Today, an update to Roughly, my new Apple Watch complication was approved, and the new version supports both the Utility and Mickey faces in addition to the Modular face that v1.0 supported. So what does it do? 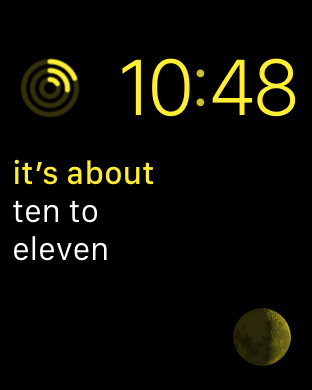 “Roughly” is a complication, a small chunk of information that can be added to a watch face on the Apple Watch. I’ve had one since release, and still really like it. In fact, I’ve reviewed it for macProVideo here, and talked about how to set up custom faces on it here. While I’d really like to be able to create custom faces myself, this is the best I can do for now. I’d seen that the Pebble smart watch had a face made entirely of words (e.g. twenty six past ten) and while I liked the idea, for myself I wanted something less precise. 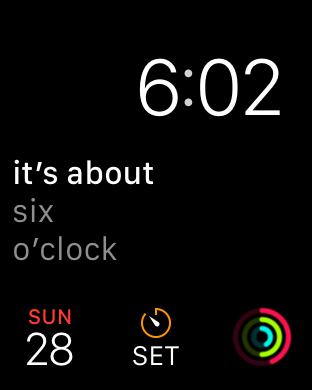 When someone asks you the time, you don’t give an exact minute-by-minute readout; almost by definition, someone who doesn’t wear a watch doesn’t care about that level of detail. What I created was something more approximate that can tell you “roughly” what the time is, to the nearest five minutes, in a natural English way. 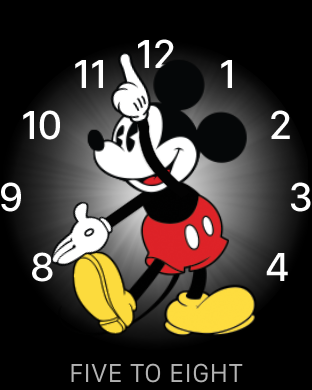 For me, this is a bit of fun and a slight convenience, though I’m finding it’s actually useful on the “Mickey” face, which is hard to read, and on the Utility face, which I find most attractive in its most minimal (yet least functional) mode. For some people though, numbers are hard to comprehend. Dyscalculalia is the numeric equivalent of dyslexia, and I hope they find Roughly to be useful. Other people haven’t yet learnt to tell time quickly on a standard analog clock, and hopefully it’ll be useful to them too. Time Travel support means you can spin the digital crown and see many times with their English-language equivalents, which should be useful to kids and students of English. Even though I made the thing, I’ve been surprised by how much I’ve enjoyed using it myself. 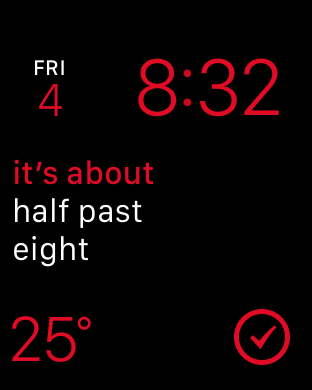 Like the Apple Watch itself, it’s not that I need it, but that I enjoy it. It’s free, available now, and I hope you like it too. Click the icon above to download Roughly for free from the App Store. P.S. 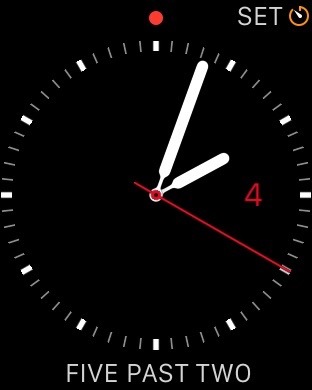 Since I made the app, I’ve been informed about “Fuzzy Clock”, a similar concept delivered on the web, and as an iPad app. Roughly is obviously a very similar idea executed differently, but those are the links to follow if you’re looking for an implementation on a different platform. P.P.S. 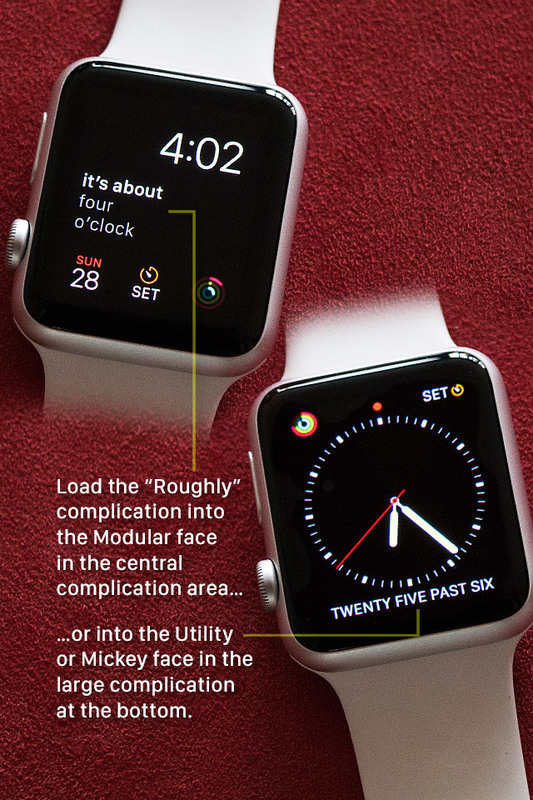 To install the complication on your Apple Watch, you actually need to download an iPhone app first, then perform a few steps. There are instructions inside the iPhone app and Apple Watch apps as to what to do next.